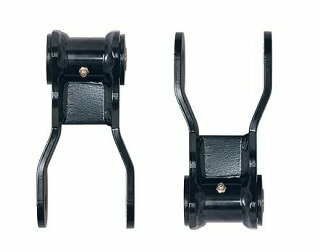 Extended rear shackles for XJ, 1.25" lift. H.D. shackle features greasable bushing and will lift rear of Cherokee 1.25". A must for maximizing wheel travel on aftermarket spring packs. Black powder coat and clearance for bumper bolts. RM20000 ~ XJ, REAR SHACKLE 5 "